1. 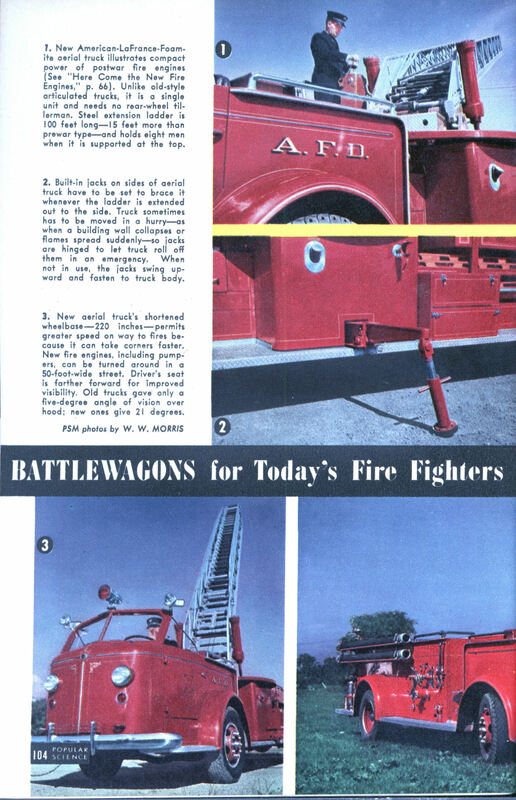 New American-LaFrance-Foamite aerial truck illustrates compact power of postwar fire engines (See “Here Come the New Fire Engines,” p. 66). Unlike old-style articulated trucks, it is a single unit and needs no rear-wheel tillerman. Steel extension ladder is 100 feet longâ€”15 feet more than prewar typeâ€”and holds eight men when it is supported at the top. 2. Built-in jacks on sides of aerial truck have to be set to brace it whenever the ladder is extended out to the side. Truck sometimes has to be moved in a hurryâ€”as when a building wall collapses or flames spread suddenlyâ€”so jacks are hinged to let truck roll off them in an emergency. When not in use, the jacks swing upward and fasten to truck body. 3. New aerial truck’s shortened wheelbaseâ€”220 inchesâ€”permits greater speed on way to fires because it can take corners faster. New fire engines, including pumpers, can be turned around in a 50-foot-wide street. Driver’s seat is farther forward for improved visibility. Old trucks gave only a five-degree angle of vision over hood; new ones give 21 degrees. 4. Every pumper is tested before it leaves the factory. This closed-cab model, with a 240-horsepower engine, throws 1,250 gallons of water a minute. In tests, water is drawn from a cistern, routed through pumper and returned to cistern. Nozzles are clamped firmly to wooden frame to withstand water pressure, which is indicated by turbulence in cistern. 5. A fireman removes cover cap on pump inlet. Size of suction hose indicates a pumper’s capacity: 41/2-inch hose for 750 gallons a minute, 6,/2-inch for 1,000 gallons or more. With hose hooked up, the discharge gates opened, throttle set, and governor turned on, pumper is ready for work. 6. This open-cab pumper races to fires at 75 m.p.h. It is 25-1/4 feet long, has a 150-inch wheel-base and handles 750 gallons a minute. Firemen ride on fully enclosed seats instead of old-style running boards and tail step, protecting crew in case of accident. 7. Front end of low-slung pumper contains towing eyes, red parking lights, headlights, two 140,000-candlepower searchlights, combination siren and flashing warning light, and cord-operated bell. Racks on far side hold ladders. That looks like the fire engine that Gumby’s father, Gumbo, drove. It’s the one where the robots go mad and Gumbo has to kill and decapitate them. 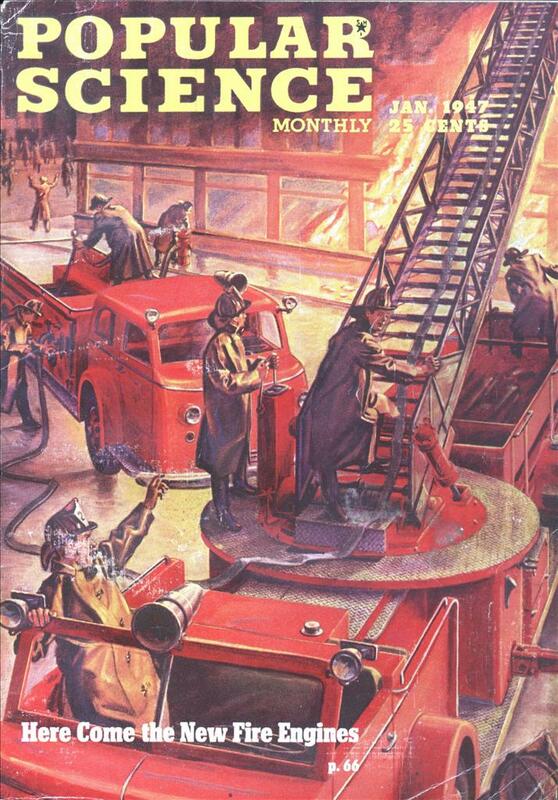 That is one stylish fire-engine. It looks like a VW Combi “Splitter” at the front. Late 40’s vehicles often look fantastic.